In August of 2009, I bought a Kindle. I was immediately quite happy with it (see “Impressions and advice from a new Kindle DX owner“), and I continue to be so these two and a half years later. My Kindle has become a major part of my reading world as a whole, particularly as a device for liberating me from the backlit screens and chair-bound posture of laptop and desktop computers, since my main use of it has been to read the multitude of articles, essays, blog posts, books chapters, and other items that I find every day on the Internet. But that doesn’t mean I’m a fan of the current and near-universal trend away from print and toward a wholly electronic world of reading. Nor am I fan of the evangelistic zeal displayed by some of the trend’s proponents. As I mentioned last week, it’s important to maintain a vital relationship with paper, and this means, at least for me, remaining engaged in an ongoing balancing act, in the course of which certain truths about the digital reading experience have become ever clearer. [M]y chief qualm is that there’s something offputtingly utilitarian and perhaps too efficient about the Kindle. Marshall McLuhan, or somebody like Marshall McLuhan, once said that you don’t actually read the morning paper, you slip into it like a bath. That about nails it. But reading the Timeson the Kindle feels nothing like taking a bath. It’s more like getting a news douche. I don’t believe news should be quite so efficient. There’s something deeply pleasing about the slouchy, tactile immersion of reading printed news. I imagine an eight-year-old walking into a cathedral in the 18th century and deciding to join the clergy, or through the Corinthian columns into a grand downtown bank in the 19th and becoming a banker. I’m pretty sure Sundays at Gold’s, wandering through the canyons of newsprint, made me decide to be a writer, smitten as I was by the sheer physical monumentality of the news. Will anyone growing up getting news through a Kindle — or some other reading appliance — have a clue about the great cathedrals of information we once inhabited? I doubt it. And that makes me a little sad. I only discovered Curtis’s piece this morning, and I find that his sensitively expressed observations about the act of reading the news on an e-reader run parallel to my own emerging sense of the e-reader experience as a whole, especially during the past twelve to eighteen months, when it seems we’ve crossed some sort of cultural threshold. These days you can hardly blink without finding that during the interval some new development has occurred or statement has been made. Words, images, data, models — all of the things that research creates — have been liberated from paper to the more malleable and dynamic world of bits and bytes. Yet when it comes to reviewing, publishing, and distributing research, the academy runs the risk of discouraging digital scholarship through structures that inhibit innovation and fail to reward innovators…If we do not create mechanisms that reward faculty and students who form digital-research communities, then innovation may bypass universities entirely, putting us at risk of falling behind institutes, private companies, and even individuals…The day of the typewriter is now long past. In its place, digital technology gives our faculty and students the ability to be as creative in how we express ourselves as we are in the research itself. Rewarding them will open the door to a new world of scholarship. A resistance fighter understands that technology must never be accepted as part of the natural order of things, that every technology — from an IQ test to an automobile to a television set to a computer — is a product of a particular economic and political context and carries with it a program, an agenda, and a philosophy that may or may not be life-enhancing and that therefore require scrutiny, criticism, and control. In short, a technological resistance fighter maintains an epistemological and psychic distance from any technology, so that it always appears somewhat strange, never inevitable, never natural. This ironic distance from all of our technologies, this recognition that they’re never part of the natural order of things, is exactly what the evangelists of the digital reading revolution want us to forget or, better yet, never achieve. But for me, against their wishes, it’s exactly what my ongoing Kindle experience has come more and more to evoke. And the more aware I become of the actual experience of reading on my Kindle, the more bloodless this experience comes to seem. This is despite and in tandem with the fact that I continue to find my Kindle a valuable tool in my reading life. I expect this tension to endure for the foreseeable future. And I view it as a positive thing. Posted on April 2, 2012, in Science & Technology and tagged e-books, Kindle, mind and media, Neil Postman. Bookmark the permalink. 2 Comments. i love print. paper. the book, newsletter, broadsheet, etc. that i can hold in my hands, put down and take up at my leisure, needing only light and my ability to read to enjoy. i don’t diss the material that’s electronic–the ability to click links and all–but it seems ethereal, so tenuous, so easily lost. i do love the expansion that electronic publishing has given us, and the access to so much . . . Your preferences sound much like my own. Of course, one of the things the Kindle does rather well is to bridge the gap between computer-based reading and traditional print-based reading. 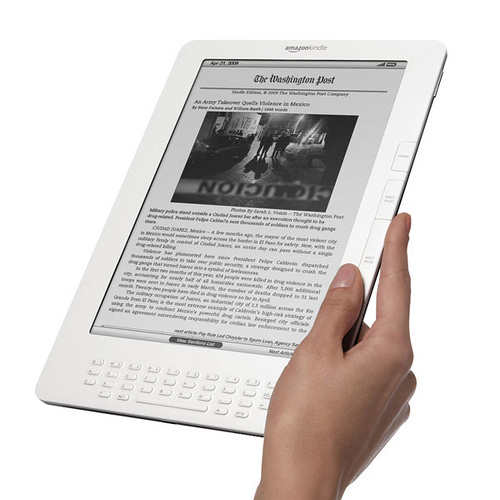 Ditto for the Nook, the Sony Reader, and other devices that use e-ink technology (the non-backlit screen that requires ambient light to be seen, just like a paper page) and are solely or mostly dedicated to reading. I respect Amazon’s Jeff Bezos for his insistence that there’s a definite market for such devices in a media environment that has become ever more focused on visual communication during the past century (or actually century and a half). And I’m encouraged by the fact that, if the e-book revolution truly is an inevitability, as now appears self-evident, we have a guy like him, a guy who has a true love of reading, sitting in one of the positions of major influence. Then again, Bezos is a mortal whose time will pass, so, as in all things, it’s not safe to place our sense of security in a single person. The inherent pressure of e-readers as a medium will exert, and is currently exerting, a transformational influence on reading as a cultural and psychological experience. The issue of real long-term importance is the question of what this innate influence or pressure really is.